Usually around the first of the year I write about raising your prices – which you should be doing – but this year, I want to do something a little bit different. I have a challenge for YOU! For the next 30 days, I want you to TIME yourself when you are working on ANY quilt. FWIW – I time myself on 98 % of the quilts I work on, and yes, I can give you all sorts of timing details on the quilts I have done! What to time – I break my timing into three major sections – putting the quilt on the machine, actual quilting time and “after quilting” time. Putting the Quilt on the Machine – Why is this important information? Remember back to when you were a beginning quilter (even if you weren’t quilting as a business.) How long did it take you to put a Queen size quilt on your machine? If you were like me, it took about 3 hours, maybe longer. My thoughts were, there is SO much fabric and SO many big pieces and where to do they all go and what gets pinned, etc., etc. Today, after putting (literally) a thousand + quilts on my machine, I can put a Queen size quilt on the machine in about 35 – 45 minutes, if there are no major problems. 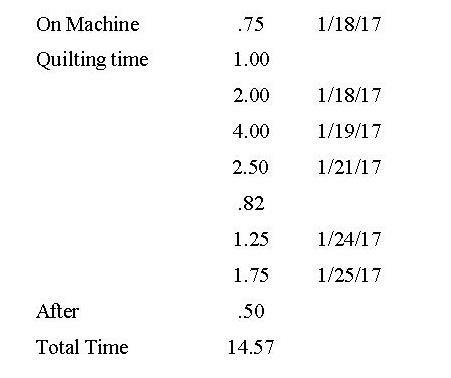 If you are a fairly new quilter, after more than a few quilts, you should see a decrease in the amount of time it takes you to put a quilt on the machine. Once you are aware of the time it takes you to put a quilt on the machine, you may be able to figure out more efficient ways to put a quilt on your machine. Even though you are not “quilting” when you are putting a quilt on to the quilting machine, I do consider it as “quilting time” and include it in the total time it takes to quilt the quilt. Actual Quilting Time – This is the time you are standing at the machine and actually working on a quilt. It makes no difference if you are quilting with a computer or hand guiding the machine. It also makes no difference if you are quilting pantographs, doing free hand work, working with templates or doing super duper over the top super dense custom quilting. If you are touching the machine, the needle is moving, stitches are being made, bobbins are being wound or you are moving the quilt from workspace to workspace, this is actual quilting time! This will be the bulk of the time you are working on your quilt. For many years, I drove a school bus and I had to keep track of my time on the routes, etc., Instead of counting minutes, we counted hundredths of the hour. Here is how it worked – the clock was divided into 100’s, so 15 minutes was .25, 30 minutes was .50 and 45 minutes was .75 of an hour. For simplicity’s sake, 5 minutes is calculated a .08 of an hour. This makes things so much easier to calculate and I continued doing this when I time my quilts. Example – if it took me 45 minutes to put a quilt on the machine, I would write down .75 hours. If I was quilting for 55 minutes, I would write down .91 (45 minutes = .75, 10 minutes = .16. 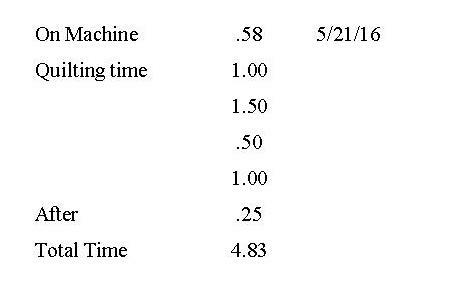 So, .75 + .16 = .91) If I was quilting for 1 hour, 30 minutes, I would write down 1.50 hours. Most smart phones have a clock / timer/ stopwatch function on them. Some people like to use the stop watch function, some people prefer to set the time for a specific amount of time and work until the timer goes off. However you like to track your time, do it and write it down. Many times when I’m quilting I listen to podcasts, each of which is about 40 minutes long. I will keep track of the number of podcasts I have listened to when I calculate my time. If nothing else, write down your start and finish time and figure how much time it was. Note: I like to add the date to my times. Many times I am working only a few hours a day on a project – the project may take only 6 hours, but it might have taken me 4 days to do them! While you are timing yourself, you can break the time down into categories / sections / repeats / rows / techniques, etc. For example, when I quit pantographs, in addition to the time I am tracking on the whole project, I will time myself on the actual quilting time – the time the machine is moving – on at least one row of the pattern. Let’s say that for a queen size quilt, from raw edge to raw edge, one row of pattern took 30 minutes of quilting time. It took another 10 minutes to do the “roll up” and re-setting of the pattern, etc. You can calculate that it will take 40 minutes (.50 + .16 = .66 hours) to quilt one row. If your pattern is 10 inches wide and your quilt is 100 inches long, that will 10 pattern repeats. At 40 minutes /.66 hour per row that would equal about 6-1/2 hours to quilt. I do a fair amount of template work. 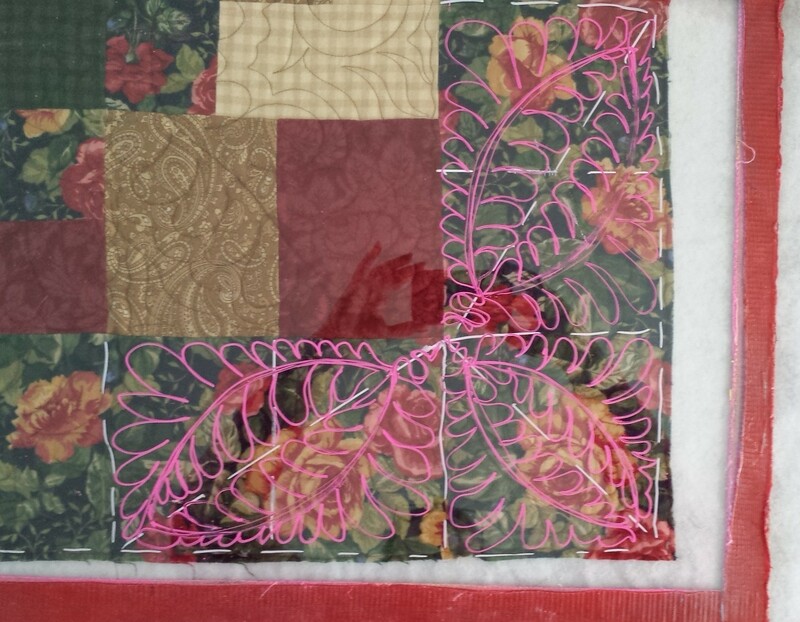 When I am working with templates, I will time myself per block / motif / border section / etc., when using that particular template, in addition to the total time it takes to finish the quilting. As you can see, in addition to your actual quilting time, you can break your time into as many “pieces” as you want to determine all sorts of things. Those of you who “float” the bottom of the quilt top, I would love to know how much time you take to “fuss” with the quilt top to keep it straight and smooth each time you do a “roll up” of the quilt. If some of you could send me this info, I would greatly appreciate it. Then there is the “After Quilting” Time – What is after quilting? To me, that is things that need to be done to the quilt before the quilt is taken off the machine and before it is either ready for binding or to be given back to the customer. For example – After the main quilting is done, and before the quilt is taken off the machine, I inspect the quilt both top and the quilt bottom / backing fabric to make sure the stitching is good, that there are no tension issues on the back, no un-quilted spaces, etc. If anything needs to be fixed with the machine, I do it at this time. Many times when I use templates I will drag my thread from place to place. These “dragged threads” need to be trimmed from the back, and yes, I time this too! The threads have already been trimmed on the quilt front during quilting. I like to make a chart and write everything down. click on the chart for a larger view. I like to round my numbers, so this quilt took me (rounded up) 5 hours from start to finish. This quilt was free hand quilted. 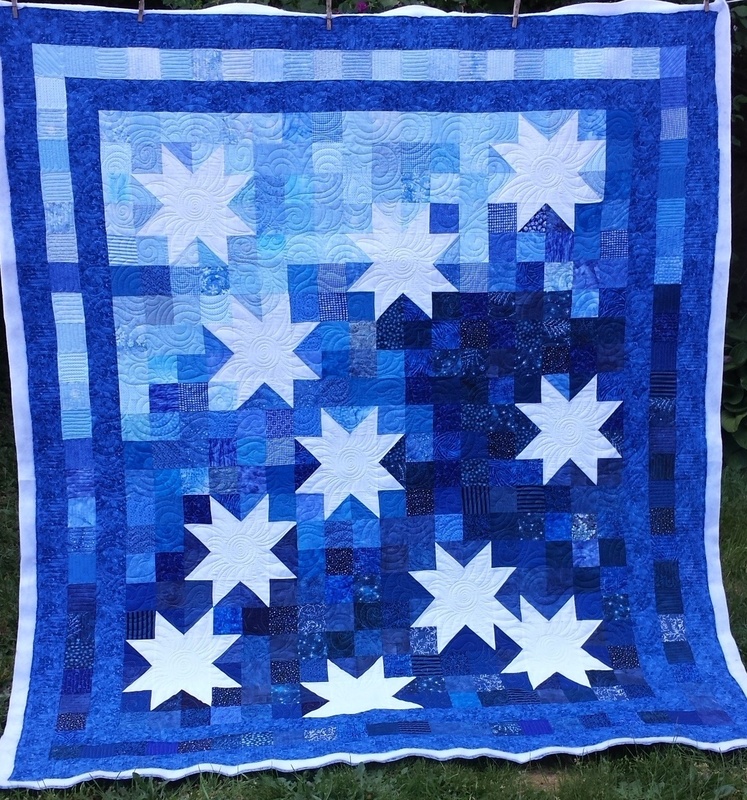 Here is another quilt – the photo is of half the quilt. This quilt was quilted free hand, but there was a TON of quilting , LOTS of detail work and it was HUGE!! As you can see, this quilt took me 14-1/2 hours (rounded down slightly) over 6 days to complete! I also had some stitching issues that had to be taken out and re-quilted and those were included in the times above. I don’t want to overwhelm you with more details, so I will end here by saying – accept my challenge and time yourself for the next 30 days and see if you can see some interesting trends in YOUR quilt and quilting. I will write more about this in 30 days. Until then, keep on quilting!